Photo by Janice Humble • A killdeer wanders in a grassy area near the Wal-Mart on Volunteer Parkway in Bristol. The killdeer, a species of plover, is one of the more common shorebirds found in the region. I’m always glad to lend a hand at identifying birds. 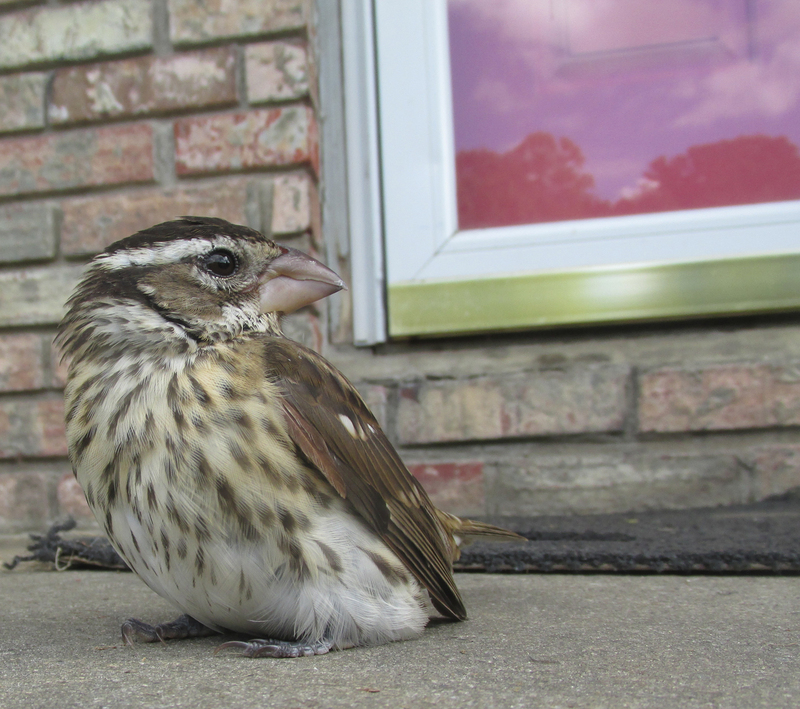 If you’re uncertain of a bird’s identification and have a photo of the bird in question, assistance is an email away. Janice Humble emailed me seeking some help with identifying the bird in a photograph attached with her message. She noted that the bird was accompanied by a companion in the grassy area near the Wal-Mart on Volunteer Parkway in Bristol. She also noted that the two birds uttered loud “peeps” during her observation. The bird turned out to be a killdeer, a species of plover native to North America. Plovers belong to the family of shorebirds that include various sandpipers, curlews, dowitchers, stilts, avocets and other species. The killdeer is a rather common shorebird that finds itself at home far from the seashore, often present in habitats such as pastures and golf courses, as well as the grassy areas near the concrete and asphalt jungles that surround Wal-Marts and other such shopping complexes. The killdeer’s famous for its faking of an injured wing. When its nest or young is threatened, a killdeer will go into an elaborate display, fluttering the “injured” wing and uttering shrill peeps to distract the potential predator. If successful, the bird will lure the predator away from the nest or vulnerable young. Once at a safe distance, the killdeer undergoes a miraculous recovery and takes wing, leaving behind a bewildered and perhaps chagrined predator. Photo by Bryan Stevens • A Killdeer explores near a stream bank. Other North American plovers related to the killdeer include American golden-plover, black-bellied plover, Pacific golden plover, Wilson’s plover, piping plover, snowy plover, mountain plover and semipalmated plover. About 70 different species of plovers exist around the world, including such descriptively named birds as little ringed plover, red-capped plover, three-banded plover and white-fronted plover. Musick’s Campground on Holston Lake has been one of the best area locations for seeking shorebirds during their migrations. The shore near the campground has been a magnet for persuading unusual shorebirds to pause their journey to rest, refresh and refuel. The location’s privately owned, but individual wishing to bird the shoreline can enter by signing the guest book located a small but well-marked kiosk. Some of the most memorable shorebirds I’ve seen at Musick’s Campground over the years include whimbrel, dunlin, sanderling, greater yellowlegs, short-billed dowitcher, American avocet, black-bellied plover and semipalmated plover. In recent weeks, the location has hosted such unexpected shorebirds as red knot and red-necked phalarope. While the neighboring states of Virginia and North Carolina offer coastal birding opportunities, my native Tennessee remains quite landlocked. This fact poses a challenge for birders looking to capitalize on the seasonal migrations of shorebirds. Fortunately ponds, mudflats on the shorelines of lakes, riverbanks and even flooded fields offer adequate substitute habitat for many shorebirds. While the Mountain Empire region may lack a seashore, migrating shorebirds have learned to make do. Photo by Jean Potter • The American golden-plover, like this individual, is a long-distance migrant among the varied family of shorebirds. This varied and far-flung family is also known as “wind birds,” a term which is an allusion to the capacity of many species of shorebirds to undertake nothing less than epic migrations. Many of the shorebirds that pass through in the spring are in haste to reach their nesting grounds as far north as the edge of the Arctic tundra. In fall, many of the same birds are eager to return to destinations in Central and South America ahead of cold weather and times of scarcity. The plovers — the sedentary killdeer excepted — are among the champions of long-distance migration. According to the Audubon website, the black-bellied plover spends the brief summer season nesting in the world’s high Arctic zones but disperses to spend the winter months on the coasts of six of the globe’s seven continents. The Pacific golden-plover’s twice yearly migrations represent an even more impressive feat. This shorebird often nests in Alaska and winter in Hawaii. The website Phys.org notes that research on this plover has revealed that the bird is capable of flying almost 3,000 miles in a mere four days. The website also reveals that those plovers wintering in Hawaii cannot lay claim to longest migrations. Some Pacific golden-plovers nest even farther south in the Pacific, reaching the Marshall Islands. Photo by Jean Potter • A black-bellied plover stands out from most relatives when it wears its nesting season breeding plumage. 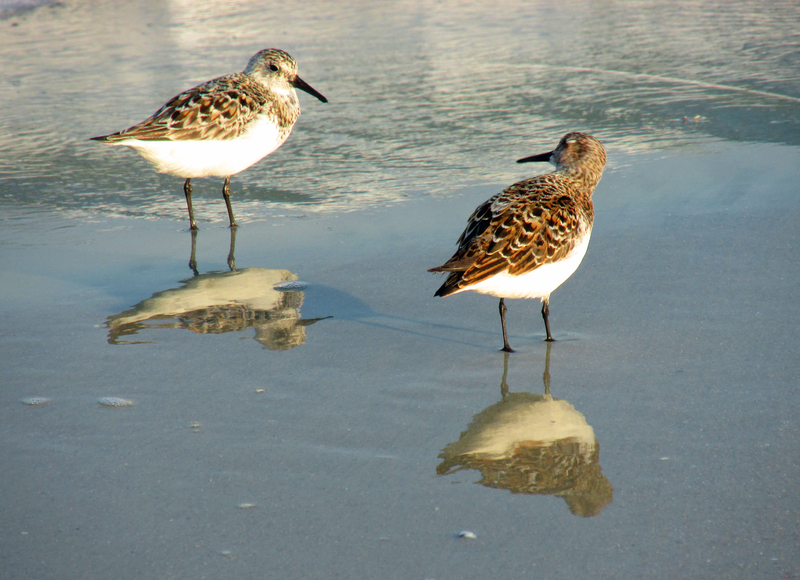 Shorebirds represent only a single family of birds migrating through the region in the fall. Songbirds from warblers and thrushes to vireos and flycatchers, as well as raptors and waterfowl, wing their way through the region every fall. Get outdoors with a pair of binoculars and have a look. It’s almost impossible not to see something, which may turn out to be a delightful and unanticipated surprise. To learn more about birds and other topics from the natural world, friend Stevens on Facebook at https://www.facebook.com/ahoodedwarbler. To ask a question, make a comment or share a sighting, email him at ahoodedwarbler@aol.com. This entry was posted in Abingdon, Birding, Birds, Carter County Compass, Common Birds of Northeast Tennessee, Elizabethton Star, Erwin Record, Fall migration, Friends of Roan Mountain, Killdeer, Plovers, Shorebirds, Uncategorized and tagged Autumn, Bird, birds, Birdwatching, Bristol Herald Courier, Elizabethton Star, Erwin Record, Johnson City Press, Jonesborough Herald and Tribune, Killdeer, Kingsport Times-News, McDowell News, nature, Plovers, Shorebirds on September 10, 2017 by Bryan Stevens. Photo by Bryan Stevens • A great blue heron and a great egret patrol a tidal creek in South Carolina. Summer heat and humidity make the summer season my least favorite one for birding, but every season brings birding surprises. I was reminded of this fact when Larry and Amelia Tipton sent me a recent email asking for help with the identification of some birds near their home. When I opened the photo, I realized that the birds captured in the image would not be considered out of place if the Tiptons lived near the coast of the Carolinas, Georgia or Florida. The birds in the photo, however, were somewhat unexpected in the foothills of western North Carolina near their home in the town of Old Fort. Photo Courtesy of Larry and Amelia Tipton • Immature white ibises in a field near the Catawba River in North Carolina. I wrote back and told the Tiptons that the birds they photographed were young white ibises. I informed the Tiptons that the two young ibises are likely testing their wings, so to speak, after leaving the care of their parents. If they like the area, and it sounds like they do, they may decide that the branch and creek are just what they need. While a diverting storm can’t be ruled out, it’s normal behavior for young wading birds to disperse far and wide after leaving the nest. North American waders, or wading birds, include such long-legged species as herons, egrets, bitterns, ibises, storks and spoonbills. Most species are associated with wetlands or coastal areas. Late summer birding is usually a period of doldrums as heat and humidity can discourage birders as well as diminish bird activity. However, it’s also the time of year when birders can make some unexpected surprises as wandering waders, such as the ibises discovered by the Tiptons, explore uncharted territory. Other waders this season showing up in unexpected location have included a wood stork found by Linda Walker in Polk County, Tennessee. Likes the ibises in North Carolina, the stork was confining its activities to a small branch bordered by heavy vegetation. These branches are a far cry from the usual wetland haunts of these two species. Overall, the white ibis and wood stork have some superficial similarities. They are both long-legged white birds with black wing tips and unusual down-turned bills that they use to probe for food, which largely consists of fish and other aquatic prey. The latter is North America’s only native stork. According to the National Audubon Society, Florida once provided a stronghold for the wood stork in the United States. Unfortunately, the population crashed in the 1990s, decreasing from around 150,000 birds to fewer than 10,000. In recent years, numbers have increased and wood storks have expanded their breeding range into South Carolina. Wood storks are nearly four feet tall, making them one of the tallest of the waders. Wood storks have a dark, featherless heads, giving them a resemblance to vultures. For the most part, they’re rather grotesque birds when observed at close quarters. Soaring overhead on thermal updrafts, wood storks look quite graceful and even majestic thanks to their white plumage and black accents. A wingspan of 65 inches gives them the means to soar easily. Worldwide there are 19 species of storks, but the wood stork (pictured) is the only native stork found in the United States. The Audubon Society identifies the white ibis as one of the most numerous wading birds in Florida, but the bird is common also in other parts of the southeast with appropriate wetland habitat. Like the wood stork, the ibis has declined in Florida in recent decades largely as a result of human encroachment. The white ibis looks like a bird that could have been invented by Dr. Seuss. The all-white plumage is contrasted by pinkish-orange legs, a reddish-pink bill and bright blue eyes. In flight, the white ibis shows black feathers on the edges of its wings. The affinity for water and wetlands relates to the diet of most waders, which consists of fish and other aquatic prey such as amphibians, crustaceans and even insects. For the remainder of July and into August and September, birders should monitor ponds, small lakes, rivers and even branches and creeks for any wandering waders. For instance, I once made a trip to a park in Greeneville, Tennessee, to observe a pink-hued roseate spoonbill that had made a rare stopover in the region. While that observation took place nearly 20 years ago, I remember vividly finding the pale pink bird playing odd man out among a flock of several dozen Canada geese as a soft rain drizzled from an overcast sky. Although many of the waders cling to coastal habitats, they have wings like other birds and know how to use them. Other waders have been known to show up in unlikely locations, including birds such as tri-colored heron, limpkin and snowy egret. Of course, I hope to hear from any readers lucky enough to glimpse one of these unanticipated finds. Enjoy your birding. Bryan Stevens lives near Roan Mountain, Tennessee. To learn more about birds and other topics from the natural world, friend Stevens on Facebook at https://www.facebook.com/ahoodedwarbler. He is always posting about local birds, wildlife, flowers, insects and much more. This entry was posted in Birding, Birds, Bitterns, Bristol Herald Courier, Common Birds of Northeast Tennessee, Elizabethton Star, Erwin Record, Friends of Roan Mountain, Johnson City Press, Kingsport Times, Least Bittern, McDowell News, Nesting birds, North American herons, Our Fine Feathered Friends, Shorebirds, Tennessee, Tennessee Rare Birds, Uncategorized, Wading birds and tagged Birdwatching, Bristol Herald Courier, egrets, Elizabethton Star, Erwin Record, Herons, Johnson City Press, Kingsport Times-News, McDowell News, Migrants, nature, Tennessee, Wading birds, white ibis on July 30, 2017 by Bryan Stevens. Photo by Leah Hawthorn/U.S. Fish & Wildlife Service • An American woodcock probes for food among fallen leaves on the woodland floor. March is traditionally a month of erratic weather, characterized by blustery winds and occasional drenching rainstorms. While the month is also a signal to get ready for the return of migrant songbirds, they are hardly the only birds on the wing each spring. Birds from waterfowl to raptors migrate through the region in March, April and May, but the real migratory champs are the shorebirds. Known for migrating incredible distances, the shorebirds are often referred to as “wind birds,” a romantic allusion to their habit of taking wing for the epic journeys that astound scientists and birders alike. Among the far-flung family are birds known as sandpipers and plovers, as well as whimbrels, willets, tattlers and turnstones. Still, among the general public, as well as some birders, the shorebirds are a much misunderstood group of birds. For example, most people could hardly be blamed for believing that shorebirds are inhabitants of only the beach and shore. In fact, some species are at home in an array of habitats, ranging from woodlands and prairies to the Arctic tundra and mudflats. Some are notoriously elusive, their camouflage and low-key behavior allowing them to escape casual notice at most times. In late winter and early spring, a true oddball among the shorebirds begins courting. 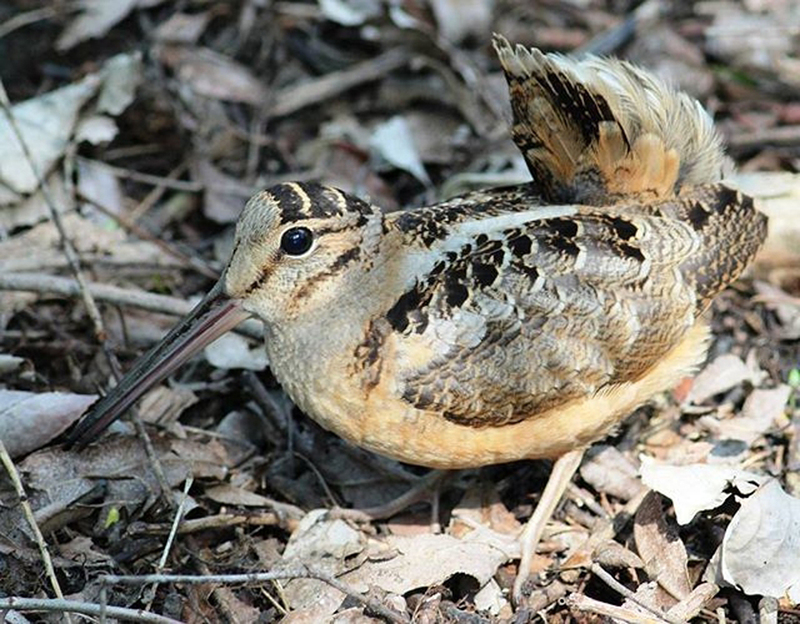 The American woodcock, also known by such whimsical names as “bog sucker” and “timberdoodle,” is a shorebird that has completely abandoned the shore in favor of woodlands and fields. Beginning as early as February, American woodcocks in the region conduct nightly courtship displays, starting at dusk, that combines aerial acrobatics with an assortment of unusual acoustical flourishes. Any wet field adjacent to a wooded area could offer a stage for these evening displays, but unless you know where to look and make an effort to do so, the American woodcock might as well remain a phantom of the night. John James Audubon, an early American naturalist and artist, painted this scene of American woodcocks feeding in damp earth. These mating rituals provide almost the only time that this bird makes itself visible to us. It’s only during this brief window that opens into their lives that we can be assured a glimpse. Even then, our peek at woodcocks often consists of a fuzzy twilight escapade as the bird flings itself heavenward only to make a spiraling descent a few seconds later. The displays begin with a distinct vocalization, a type of “pent,” that also has the quality of sounding like some sort of mechanical buzzer. Once the displays conclude for the season, the birds assume nesting duties, usually unobserved by humans. The rest of the year, almost nothing but blind, sheer luck would allow a birder to stumble across an American woodcock. It’s almost as if they disappear after these spring flights of fancy. For the most part, the “wind birds” leave lives in habitats that keep them separate from humans. On occasion, however, one of these shorebirds pays an unexpected visit to members of the public. Tom and Helen Stetler, residents of Elizabethton, Tennessee, shared an account of one such visit in a recent email. Photo by Tom Stetler • A Wilson’s snipe visits the yard at the home of Tom and Helen Stetler in Elizabethton, Tennessee. He estimated that the bird stayed in their yard for about 15 to 20 minutes. “I kept trying to get a good picture of its long bill and finally did,” he said, enclosing a photo of the visiting bird with his email. After I examined the photo, I noticed that the unusual visitor was actually not a woodcock but a closely related bird known as a Wilson’s snipe. The confusion of the two birds is quite understandable. The snipe and the woodcock bear a superficial resemblance to each other. The American woodcock belongs to the genus of Scolopax, a Latin term for this group of eight oddball shorebirds. Other members of the genus include the Eurasian woodcock, the New Guinea woodcock and the Sulawesi woodcock. Photo by Bryan Stevens • The Wilson’s snipe is remarkably capable of blending with its surroundings. Wilson’s snipe, which is closely related to the woodcock, inspired the term “snipe hunt.” Regarded as lessons in futility, these hunts are not seeking some mythical quarry, although some people mistakenly believe there’s no such bird as a snipe. In fact, there are several species of snipes, although only one — Wilson’s snipe — can be found in much of the United States. Some of the world’s other 25 species of snipe include Jack snipe, wood snipe, pintail snipe, noble snipe and imperial snipe. Any wet field or pasture may conceal hidden snipes during the spring. A few sometimes spend the winter in the region. Flushing a snipe from a tangle of grass right at your feet as you walk through a wet field always works to get the heart pumping faster. Snipe also stage spring mating displays that are not quite as elaborate as those of the woodcock. I suspect that recent heavy rains made the yard at the Stetler home similar enough to a flooded field to attract the visiting snipe. 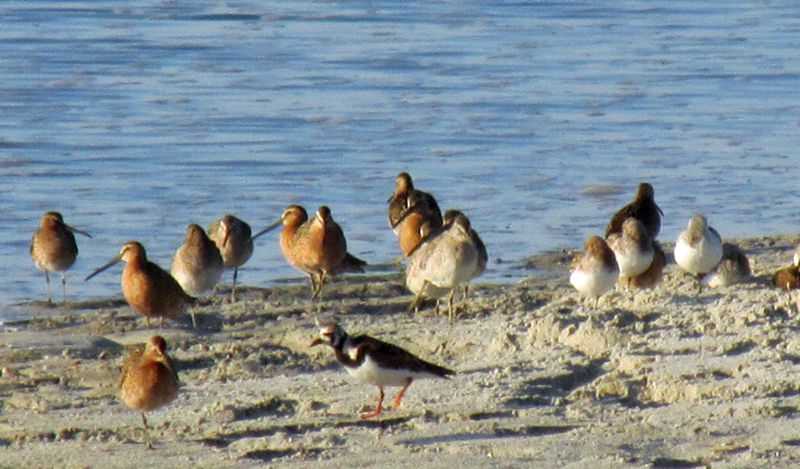 While both the Wilson’s snipe and American woodcock are elusive birds able to easily conceal themselves from view, other shorebirds definitely stand out in a crowd. For example, the gangly black-necked stilt and the spindly American avocet are surely two of the most striking, almost comical shorebirds in North America. The American woodcock is also known by such whimsical common names as bogsucker and timberdoodle. In addition, members of the shorebird family vary greatly in size. North America’s smallest shorebird, appropriately enough, is the least sandpiper, a tiny shorebird less than six inches in length and weighing barely an ounce. The least sandpiper breeds widely across northern Canada and Alaska and winters across the southern United States and Mexico. The largest shorebird — depending on how “largest” is defined — is either the Far Eastern curlew or the beach thick-knee. The Far Eastern Curlew is a large shorebird most similar in appearance to North America’s long-billed curlew, but slightly larger. This bird definitely has the longest bill of any shorebird and ranks as the world’s largest member of the sandpiper clan. The Far Eastern curlew is 25 inches in body length, although the Eurasian curlew is almost the same size. If it comes down to weight, the heaviest shorebird is the beach thick-knee, a bird native to Australia and the islands of Southeast Asia and India. 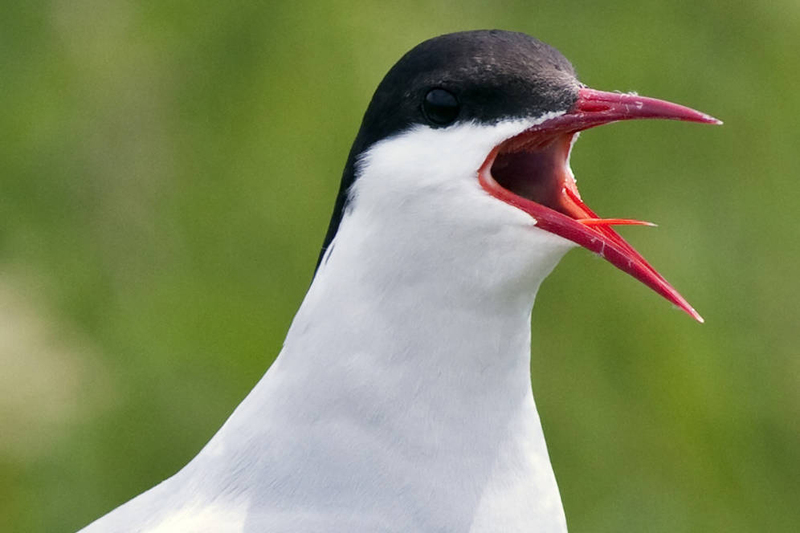 This unusual shorebird can weigh as much as 2.2 pounds, but is only 22 inches long. The Far Eastern curlew, in comparison, weighs a mere 27 ounces. In the coming weeks, check the edges of ponds, the banks of rivers and shorelines of lakes for migrating shorebirds. Don’t forget to keep an eye on your yard, too. Spring migration is always full of surprises. Bryan Stevens lives near Roan Mountain, Tennessee. To ask a question, share an observation or make a comment, email him at ahoodedwarbler@aol.com. This entry was posted in American woodcock, Birding, Birds, Bristol, Common Birds of Northeast Tennessee, Erwin Record, Shorebirds, Uncategorized, Wilson's snipe and tagged American woodcock, birds, Bristol Herald Courier, Carter County Compass, Elizabethton Star, Erwin Record, Johnson City Press, nature, Shorebirds, Spring migration, Tennessee, Wilson's snipe on April 2, 2017 by Bryan Stevens. Since the Volunteer State has no access to the sea, it is sometimes amazing how many birds affiliated with coastal areas can be found if you know when and where to look. A recent seven-day visit to coastal South Carolina reinforced the romance of a group of related birds known collectively as shorebirds or, in a somewhat more adventuresome context, “wind birds.” This diverse family of birds range in size from sparrow-sized sandpipers to larger species such as American Avocet, Long-billed Curlew and Marbled Godwit. During daily visits to Huntington Beach State Park, located within five minutes of my brother’s new home on Pawleys Island, S.C., I observed plenty of these “wind birds.” I saw a range of species, including Wilson’s Plover, Short-billed and Long-billed Dowitcher, Greater Yellowlegs, Sanderling, Least Sandpiper, Ruddy Turnstone, Spotted Sandpiper, Semipalmated Sandpiper, Black-bellied Plover, Semipalmated Plover, Dunlin and even the gangly Black-necked Stilt. A pair of Sanderlings at surf’s edge at Huntington Beach State Park. 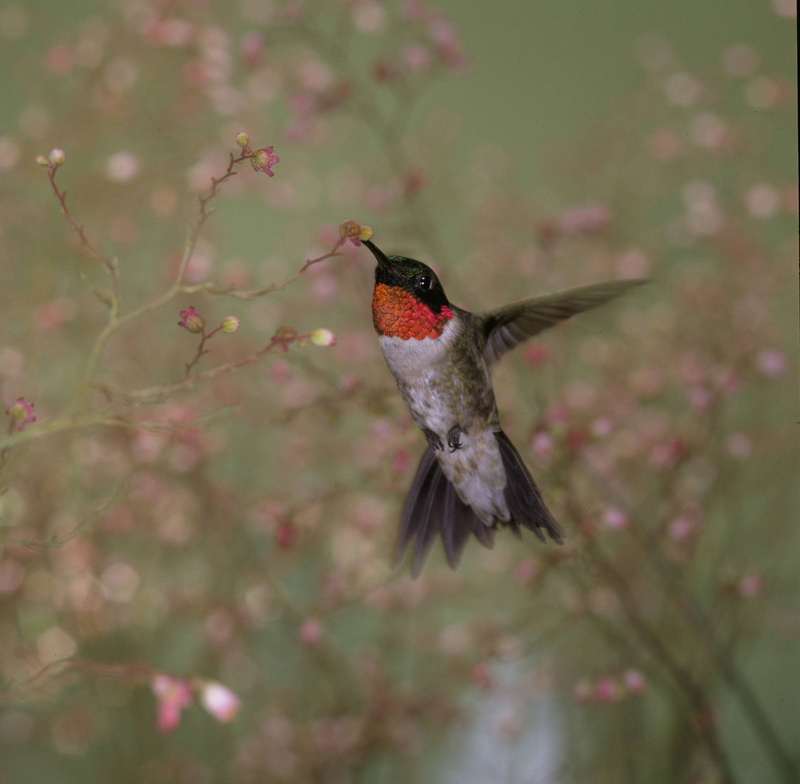 Known as “wind birds” for the propensity of many members of this extended family to stage long-distance migrations, some species fly through Northeast Tennessee each spring and fall as they migrate to and from distant nesting grounds. I have seen several species — Wilson’s Snipe, Greater Yellowlegs, Pectoral Sandpiper, Least Sandpiper, Solitary Sandpiper and Spotted Sandpiper — in the region this spring. Their stays are usually of brief duration as they are eager to push farther north. Many of them will not stop until they reach the edge of the Arctic tundra. While I was enjoying seeing a wide range of shorebirds in South Carolina, two Stilt Sandpipers put in a rare appearance in Northeast Tennessee. I hated to miss them. I’ve only seen one other Stilt Sandpiper in the region, and that observation took place back in 2000 at Austin Springs on Boone Lake. The Stilt Sandpipers were found by Brookie and Jean Potter on the Watauga River at Rasar’s Farm in Elizabethton. The couple reported that it was their first spring sighting of Stilt Sandpipers, as well as their first Carter County sighting of this species. The photo at the start of the column, provided by Jean Potter, shows the two Stilt Sandpipers bordered by a pair of Greater Yellowlegs. Stilt Sandpipers making migration stops in Tennessee still have a long way to travel. 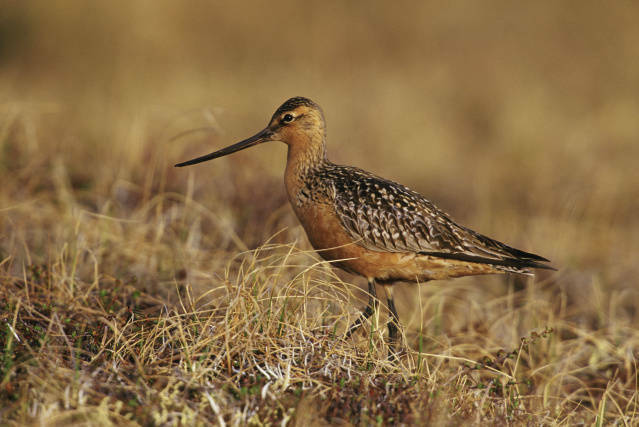 These shorebirds nest on the Arctic tundra beyond the tree line. Wet sedge-meadows with raised ridges and hummocks provide nesting habitat. After the nesting season they fly south as far as northern South America and can be found at fresh water ponds, marshes, lagoons and flooded fields. This medium-sized sandpiper stands out from most of the sandpipers in its size range. It has long, greenish legs, as well as a long neck and bill, which is drooped at the tip. In breeding plumage, this shorebird has a distinctive chestnut cheek patch. During my South Carolina stay, I didn’t encounter any Stilt Sandpipers. I did, however, find three Black-necked Stilts. The only time I have seen this unusual shorebird in Tennessee took place on Oct. 13, 2004, at Austin Springs on Boone Lake in Washington County. The bird, first found by Rick Knight, drew many excited birders to the location for looks at this shorebird before it departed to continue its migration flight south. Two Black-necked Stilts forage along the causeway wetland at Huntington Beach State Park. I have also seen Black-necked Stilt on Fripp Island, S.C, as well as in Utah. The world of shorebirds has produced many look-alike species, including many of the small sandpipers often collectively labeled as “peeps” by birders. The Black-necked Stilt, however, is not at all likely to be confused with any other shorebird. It is a slender bird atop a pair of extremely long pink legs. It has a two-tone appearance with black upper parts and white underparts. The black and white dichotomy continues along the bird’s long neck and head. This bird also has a thin, needle-shaped bill that it uses to delicately pluck aquatic insects and other prey from water or mud. I first spied the Black-necked Stilts at Huntington Beach State Park while walking on a marsh boardwalk near the park’s Nature Center. They flew toward the causeway, so I got into my car and drove there to try to re-locate them. 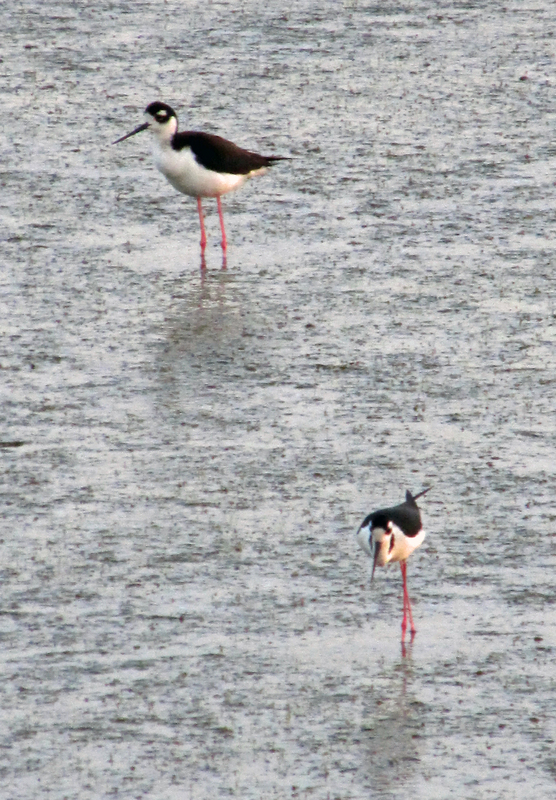 I did find two of the stilts feeding along the causeway, but I never managed to find the third bird. I watched the two Black-necked Stilts foraging for food in shallow water shared by egrets and alligators. The two birds, despite a somewhat gangly appearance, moved with elegantly efficient strides on their long pink legs. This bird feeds on an assortment of aquatic creatures, including small fish, insects and tadpoles. The seeds of aquatic plants also provides some of the food in its diet. I also saw several plovers, another group of shorebirds, while in South Carolina. Wilson’s Plover was one that stood out during my visits to Huntington Beach State Park. Wilson’s Plover is a coastal shorebird that breeds on both coasts of the Americas from the equator northwards. Its range extends north to include much of the U.S. eastern seaboard as well as the Pacific coast of Mexico. A Wilson’s Plover in the dunes at Huntington Beach State Park in South Carolina. 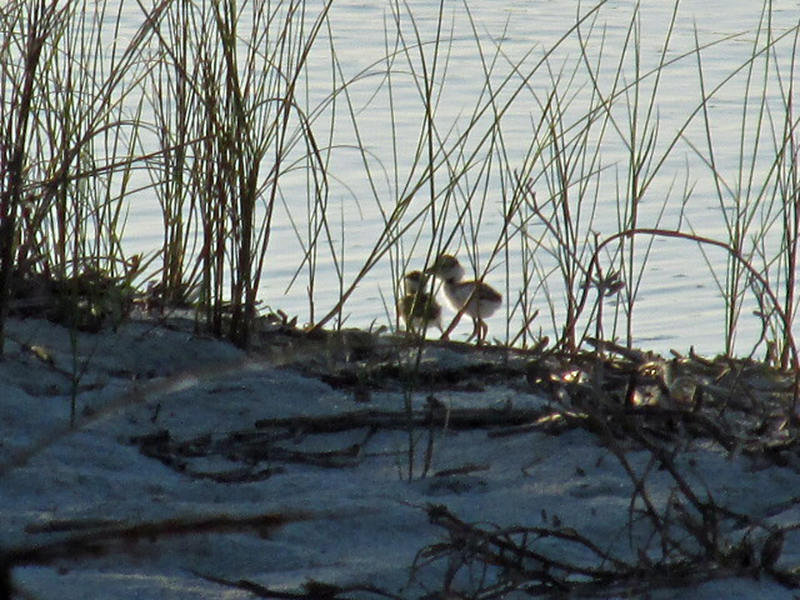 I’ve observed Wilson’s Plovers on Fripp Island, S.C., in the past, but those sightings have been rather sporadic. I have also observed this bird at one other location — at Douglas Lake in Cocke County back in the late 1990s. The Wilson’s Plovers at Huntington Beach State Park were nesting in the dunes, which also gave me an opportunity to see some young plovers. A young Wilson’s Plover looks like a ball of downy feathers standing on toothpicks. This plover nests on a bare scrape on sandy beaches or sandbars. To protect the plovers, as well as other nesting species, this section of dunes on Huntington Beach State Park bars the entry of dogs. It is also roped off to prevent accidental intrusion by people. A pair of Wilson’s Plover chicks at Huntington Beach State Park in South Carolina. Most of the Wilson’s Plovers that spend the summer in the United States retreat each fall, although a few migrate only as far as Florida. The rest spend the winter as far south as Brazil. For a small shorebird, the Wilson’s Plover sports a thick, blunt and relatively large bill. In fact, this bill — that looks too big for its body — is a good way to identify this shorebird at a glance. The Wilson’s Plover forages for food on beaches. It has a fondness for crabs, which may explain the size and shape of its bill, but this bird will also eat insects, marine worms and other small organisms. 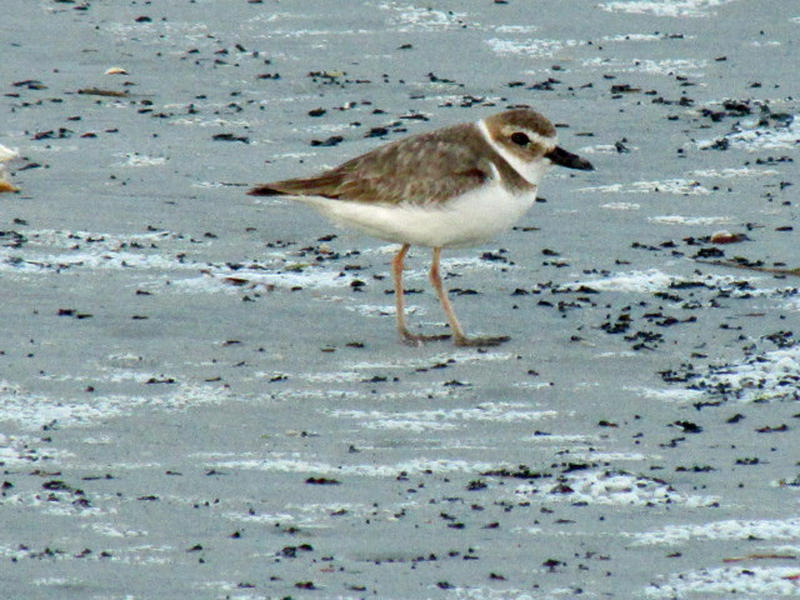 The Wilson’s Plover is larger than the related Semipalmated Plover and Piping Plover but considerably smaller than such relatives as Killdeer and Black-bellied Plover. This shorebird weighs only a couple of ounces, with a length of about eight inches and a wingspan of 19 inches. The Wilson’s Plover has a dark neck ring, grayish-brown upper parts, a white underside and pinkish legs. This bird was named after the Scottish-American ornithologist Alexander Wilson. Wilson collected the type specimen during a trip in May of 1813 to Cape May, N.J. Other birds named for this pioneering bird expert include Wilson’s Warbler, Wilson’s Phalarope, Wilson’s Snipe and Wilson’s Storm Petrel. With a few exceptions, most of the shorebirds that I have found along the Atlantic Coast I have also observed here in land-locked Tennessee during spring and fall migration. It’s one of those little known facts I enjoy sharing with people, who are often surprised that these “beach birds” also make visits to our state. Make a comment, ask a question or share an observation by sending an email to ahoodedwarbler@aol.com or posting a comment here on my blog. I am also on Facebook. A mixed flock of Short-billed and Long-billed Dowitchers and a Ruddy Turnstone at Huntington Beach State Park. This entry was posted in Birding, Birds, Shorebirds and tagged Black-necked Stilt, Calidris himantopus, Carter County Compass, Charadrius wilsonia, Dowitchers, Elizabethton Star, Erwin Record, Himantopus mexicanus, Peeps, Plovers, Sandpipers, Shorebirds, Stilt Sandpiper, Stilts, Wilson's Plover, Wind birds on May 25, 2014 by Bryan Stevens.